Social Media has quite a dynamic element attached to it – everything can go south in a matter of seconds – but what exactly is a social media crisis? A social media crisis can be defined as an event that can have a negative effect on a brand’s, company’s, or individual’s reputation. It could be something that happens offline and is then brought on social media, or it could occur on social media channels and then spread. Let’s exemplify a little. A social media crisis could begin by means of an inappropriate photo, something completely wrong with one of your products (let’s say you are a company that produces beverages, and someone says they have found something that should not be in that bottle or can). Also, inappropriate postings of one of your employees or maybe an ex-employee could be encapsulated within the context of a social media crisis. Basically, we are talking about anything that can reflect negatively on a company. And given the dynamic element we were mentioning earlier social media allows things to spread quite quickly, amplification is quite a powerful tool within social media. Posts can be shared an infinite number of times and with a blinding speed and having to deal with them can quickly start feeling like using band-aids on a sinking boat. And because a social crisis does not really announce its presence beforehand, it is vital that you plan ahead. Basically, every company should have a social media crisis management plan in place so that you are ready even for the worst situations. By doing this, you will be able to mitigate and hopefully control the damage, you will not deprecate your relationship with your customers or at least, you will be able to repair it and last, but not least, you will learn a lot and your company will be better, stronger. Monitoring, social listening should be your best friend. Why do we say this? Because you can get ahead of potential issues. Also, it could also help you prevent issues from turning into a crisis. By keeping an eye on what people have to say about your brand, you will become aware of what your audience is feeling and a major advantage of doing this is that over time, you will get to understand the difference between a flickering fire and a wildfire, namely, you will be able to identify a significant sentiment change when it comes to your audience and your business and prevent an issue from turning into a crisis. For example, if you see a sudden increase in brand mentions, well, that means something is going on and you will need to carefully look into that and see if there might be an emergent crisis. A great tool for monitoring is Sether and it will definitely give you a hand with properly dealing with issues. And the best thing is, it will help you out to nip things in the bud. The whole idea behind a crisis communication plan is that by having this before you actually need it, it will enable you to react and respond quickly, before anything gets out of hand. After all, prevention is the best medicine. You really need to determine if you are dealing with a crisis, and not just with a disgruntled consumer – and in order to be able to identify this, you will need to focus on negative brand mentions – if there are more than 10 mentions per hour, you should communicate this information internally and continue to monitor what is going on in terms of negative brand mentions – Sether is a great tool for monitoring brand mentions and it’s free so go ahead and create your account right now. In the crisis flowchart you should have all information about who in your company should be contacted in different scenarios. So that when confronted with a crisis, people can deal with it easier. During a crisis ensure all pre-scheduled posts across all channels, organic and paid, are cancelled immediately. You don’t want that post about the great promotion you have ahead when in the middle of a crisis because things could and will get worse. Make sure at least two employees, including at least one emergency contact on the PR team, have access to your native social channels and/or social content management tool. And they all should be trained on how to deactivate advertising and pre-scheduled organic posts. After having done so, you should make sure you issue a statement about the current issue or crisis. It could be something like this - Our official statement on today's incident will be issued shortly. And then, make sure you communicate your official statement. Quick reactions are key within a crisis. Pre-approved social posts and messages you can share with your audience – when in crisis it is important to know that people are expecting an answer from you and of course, a solution. And if the solution is a process, an answer is much demanded, and you will need to respond as quickly as possible. In order to be able to quickly respond, having pre-approved messages could get you closer to saving the day. Basically, you should create a document that has templates for different situations and adapt them if needed in order to establish a clean, solution-oriented response. Also, your social posts will need to be looked into and pre-approved to make sure your communication crisis is on the same lines. You do not want to make mistakes at this point. It is important to have a constant and quick answer to whatever message that appears in connection to your crisis. Nobody likes to be left out and you want to make sure people see you are present and dealing with the problem, and what is even more important, by doing so you get to strengthen the relationship with your customers. Every voice matters and your customers will appreciate if you listen and react. The most important thing to keep in mind here is that at a first point in your crisis, acknowledging that there is a problem is crucial and letting people know that more information is coming soon, as we were saying earlier. Also, make sure you share updates about what your company is doing to solve the problem. Being transparent about your efforts can take you a long way. If dealt with in the right manner, a crisis can ultimately turn into PR magic. We can all remember KFC and their running out of chicken, right? And if you were wondering how can a social media crisis can go awfully wrong, here are a few examples that will make you start planning your social media crisis communication, in case you don’t have one already. 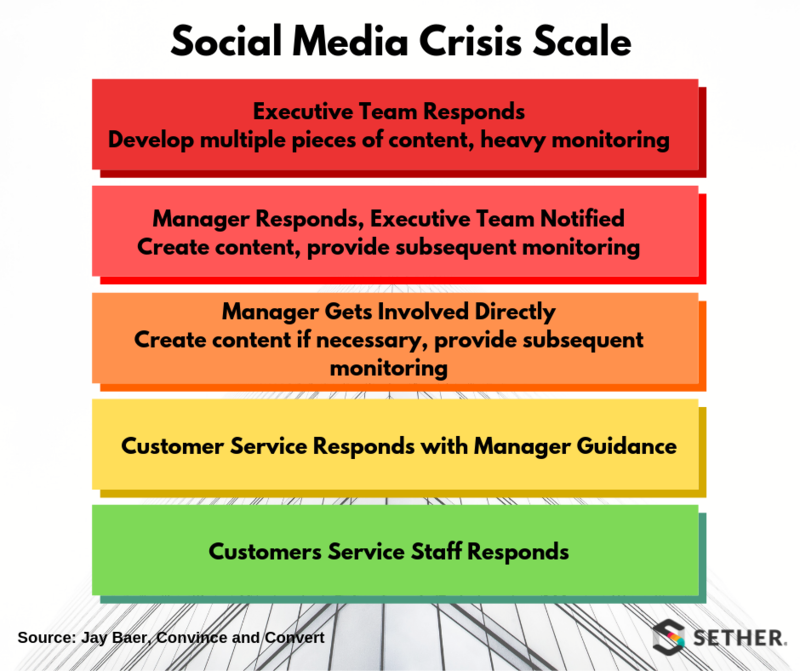 Your social media crisis should be made accessible to all employees and also, run through by each member of your crisis team on a regular basis. Needless to say, you have to revise and modify the plan after each crisis and in absence of a crisis, at least once per year. Another good practice for dealing with social media crisis could be social media crisis trainings organized within your company in which you test different scenarios and see how things would go and how your employees would react. It is a great learning opportunity and also, a great way to make sure everybody knows the procedures and the plan, getting them ready for a real social media crisis. When it comes to social media, crises can easily spread, damaging your brand’s reputation within minutes or even seconds. And this is why it’s better to be prepared. You can’t be completely ready for a storm, but of course you can carry a survival kit with you. So, if you want to keep your customers close and happy, if you aim to regain the trust of your customers in case something goes wrong, you’ll need to really step up your game. Communicate proactively, take matters into your own hands, own your mistakes, be transparent and empathetic so that you will never be unprepared for a social media crisis.